Nothing exciting except for the fact that I dyed the yarn MYSELF - woohoo! The result was green, blue, purple stripes in one half of the skein, and blue, blue, purple stripes on the other. What am I supposed to do? 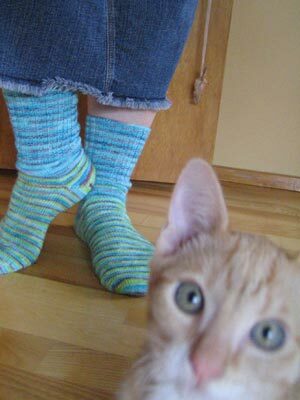 Knit two different socks? 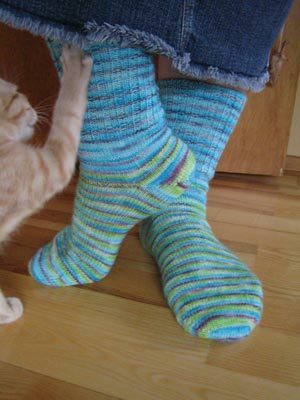 Well, this girl knows how to split a yarn: two green stripy feet for me. My appologies for the bad light but unfortunately - no blue skies! by Carola at 7:51 e.h. The socks look great! I love it. Was the Trekking undyed, or did you overdye it? I love the colors. Very kicky! júlí 07, 2006 10:00 e.h.
júlí 07, 2006 11:53 e.h.
júlí 08, 2006 2:27 e.h.
Great job with the Kool-Aid dyed socks! Love those colors! júlí 10, 2006 1:04 f.h. fabby socks! lol your cat is too cute! júlí 10, 2006 10:11 f.h.